A Redaction Error Showed Geoffrey Rush’s Damages Claim in Defamation LawsuitThe defamation trial ended without a ruling in 2018. OITNB’s Yael Stone Accuses Geoffrey Rush of Alleged Sexual MisconductThe Australian actress starred across from Rush in a 2010 production of The Diary of a Madman in Sydney. Geoffrey Rush Is Suing for Defamation Over His Accuser’s #MeToo StoryThe lawsuit claims Rush is “virtually housebound” after the accusations. Stanley Tucci’s Final Portrait Is Quietly BrilliantAs a director, Tucci appears to savor the step-by-step process of creation from both his characters and his actors, Armie Hammer and Geoffrey Rush. 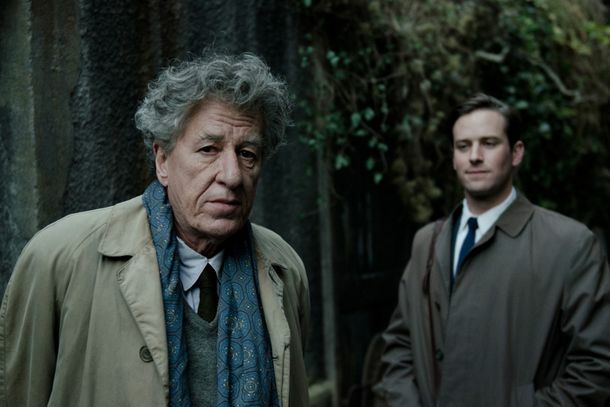 Final Portrait Trailer: Stanley Tucci Directs Armie Hammer and Geoffrey RushGeoffrey Rush plays Swiss artist Alberto Giacometti. See Geoffrey Rush As Albert EinsteinFor Nat Geo’s Genius. Geoffrey Rush Will Play Einstein for the National Geographic ChannelMore like E equals Emmy squared. Stage Dive: Diary of a Madman and Small Craft WarningsIn this Russian drama, Geoffrey Rush channels Daffy Duck. The Oscar Nominees Are Out — Now Here Are Their NarrativesVulture’s taken a look at the newest crop of contenders and the careful narrative crafted for each. 7 Potential Norbits That Could Derail This Year’s Oscar HopefulsHave any awards contenders picked follow-ups as unwisely as Eddie Murphy once did? The King’s Speech Trailer: Is This Your Oscar Front-runner?’The Social Network’ gets its rival. Industry Roundup: Garner, Nolte, RushPlus: Sleigh Bells to headline North American tour. Larry Charles to Make NBC Even NerdierPlus: Old people singing and robots! The Tonys: Billy, Liza, and Elle WoodsSo, there were no big upsets. But there were fun moments! All the Screen Stars Invading BroadwayThe phenomenon of Hollywood and TV stars hitting Broadway is a growth industry that just keeps expanding, downturn be damned. Forest Whitaker Sees Trees of Green, Red Roses TooPlus: Cronenberg does Ludlum! 7 Coen Brothers Idiot Movies, RankedWhere does ‘Burn After Reading’ fall on the register of the Coens’ comedies of buffoonery?